The SOLUS KH17 is a contemporary performance tyre for such top selling hatchbacks and saloons as Ford's Fiesta and Focus, Volkswagen's Polo and Golf and Vauxhall's Corsa and Astra. It has already won the approval of a number of major European car magazines and was awarded Best Buy status by Which? Magazine. The SOLUS KH17 features three wide longitudinal grooves for optimum wet weather performance and exceptional stability thanks to reinforced tread blocks equipped with waved semi-grooves. The KH17 is available in a range of sizes from 155/65R13 to 225/50R17 and speed ratings H to V.
Proven high levels of wet and dry traction. 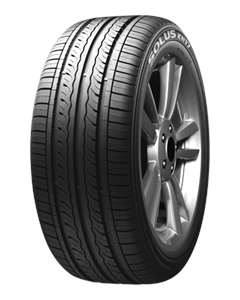 A contemporary tyre for small to medium sized cars, the Solus KH17 offers excellent stability and proven high levels of wet and dry traction. Excellent cornering grip and braking ability. Reduced heat build-up, for improved wet grip and durability. Sorry, we currently do not have any tyres with the Solus KH17 pattern in stock.